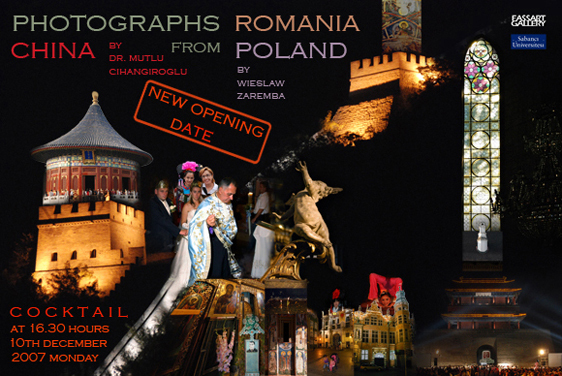 In September 2007, medical doctor Mutlu Cihangiroğlu and artist Wieslaw Zaremba traveled to China, Romania and Poland respectively. Mutlu Cihangiroğlu attended the World Federation of Interventional and Therapeutic Neuroradiology Congress in Beijing, while Wieslaw Zaremba visited several different cities in Romania and Poland in order to facilitate exchange programs with art schools in these regions. This exhibition brings the two collections of photographs together in an attempt to problematize the aims of the photographers and ask questions relevant to travel photography. Cihangiroğlu’s gaze focuses on portraits of street vendors, pedestrians, bikers, and the residents’ engagement with historical sites and sites of worship. Wieslaw Zaremba traveled to Romania and Poland with the objective of bringing “home” to Sabancı University students the historical sites of the Maramures region in Romania, the Bukovina and Modovita monasteries; the churches and Academy of Fine Arts buildings in Krakow and Gdansk; and archeological sites from Sandomierz (Poland). Zaremba captured the gravestones-as-art in the Merry Cemetery in Sapanta, created by Ioan Patras, housing poetry and paintings of the deceased. The Maramures region of Romania is reknown for its wooden churches with exterior paintings. Zaremba focused specifically on the wooden church in the village of Ieud, “The Church of the Birth of the Holy Virgin,” constructed in 1364. The church and its paintings have survived harsh weather conditions and the largest Tatar invasion of the village in 1717. The rooftop of the church is quite significant; it is the site of the Ieud Codex, the oldest writing in the Romanian language currently kept in the archives of the Romanian Academy in Bucharest. The “Voronet Blue” Monastery which combines Gothic and Byzantine features entitled it to be called “the Sistine Chapel of the East.” Likewise the Moldovita monastery was called “a parchment dipped in blue color” because of the blue undercoat for its tree of Jesse. Zaremba focused on the stained glasses of the Wawel Castel, Carmelites Church in Krakow on his trip to Poland. The Academy of Fine Arts in Gdansk and the archeological finds of Sandomierz are the last features of Zaremba’s visit.